India has offered to increase an order for U.S. Apache helicopters to drive down costs as the two sides race to close a $1.4 billion deal, officials said, the first big military contract since a new government took office in New Delhi. FILE - Visitors look at a AH-64D Apache helicopter during an airshow in Dubai, UAE. The Apache gunships and a deal for Chinook helicopters, both built by Boeing, top the agenda for visiting U.S. Defense Secretary Chuck Hagel's talks on Friday with India's incoming administration led by Prime Minister Narendra Modi. India and the United States have rapidly expanded military sales in recent years, despite discord in areas such as trade and intellectual property rights. Washington is keen to further step up defense cooperation with India, which it sees as a key strategic partner in Asia in the face of an increasingly powerful and assertive China. India has offered a follow-on order of 39 AH-64D Apache helicopters in addition to the 22 now being negotiated, a Defense Ministry official said. The two sides have been wrangling over the price of the gunships in a deal estimated to be worth $1.4 billion. The initial batch of helicopters is meant to replace the Indian Air Force's ageing fleet of Soviet-era aircraft and will be armed with Hellfire and Stinger missiles. 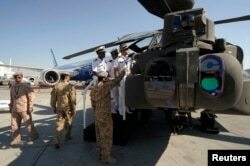 The Indian army has separately requested a fleet of at least 39 of these attack aircraft, some of which will be deployed as part of a new mountain division it is raising along the disputed border with China, an army official said. "The point is we are looking at 60-70 pieces eventually, so the expectation is the vendor will factor that in, in the price negotiations," said the defense ministry official, asking not to be named in line with ministry policy. U.S. defense sales to India have grown from the low hundreds of millions of dollars in the decade to 2008 to more than $9 billion since that year. According IHS Jane's, a defense research firm, India was the top foreign buyer of U.S. arms last year. U.S. officials say there is the potential for billions of dollars of new sales in the next few years and are hoping the Modi administration can overcome bureaucratic obstacles that have held up some deals. The two sides are also in talks to finalize a contract for the Indian Air Force to buy 15 CH-47F Chinooks, a twin-rotor helicopter capable of lifting heavy loads, also valued at $1.4 billion. Hagel's trip, which will also take him to Australia, is focused on converging U.S. and Indian interests in the Asia-Pacific, the Pentagon said. It follows U.S. Secretary of State John Kerry's visit last week and is part of the build-up to Modi's talks with U.S. President Barack Obama in Washington in September aimed at revitalizing ties between the world's two largest democracies. Hagel will discuss ways to strengthen military cooperation with India including exercises, defense, trade, co-production and co-development, Pentagon press secretary Navy Rear Admiral John Kirby said. India's Cabinet has just cleared a proposal to allow 49 percent foreign participation in the defense industry, up from a current cap of 26 percent, in a bid to boost local manufacturing and end its decades-long dependence on overseas acquisitions that made it the world's biggest arms importer in recent years. Some Western manufacturers have been lukewarm about the raising of the cap on defense investment, saying it did not go far enough for them to transfer technology to India. But Lalit Mansingh, an influential former Indian ambassador to the United States who has been pushing for greater ties with Washington, said it was a good start. "Companies that want 100 percent will wait till the sector is opened up fully, but I am pretty sure there are American companies ready to come in," said Mansingh. "They have been eyeing the market for a while now."